(Usually) Everyday I'll throw out a photo, you provide the caption, and then hilarity ensues. I'm also adding a handful of links at the bottom of the page that you should check out each day. Are you funny enough to create a caption for this photo of Junior Seau falling after being tackled by a fan during the Patriots' game against the Arizona Cardinals on Sunday.? I thought you where Brady Quinn. So you DON'T have my beer? Goddamit! Jeez, Junior...I'm in up to my elbow and I still don't feel that friggin' gerbil! Pictured above is Junior Seau tackling ghosts of Patriots past. The only thing he can tackle. As your doctor, I appreciate your dedication to your over-50 colonoscopy Junior, but this wasn't really the time or the place. The Arizona Cardinals are about to make the playoffs. This means that they just found a bunch of new fans on the bandwagon. Fans who don't yet realise that Linebackers don't actually carry the ball. By next year, it won't matter, so the Patriots aren't filing any charges. Ken Wisenhunt approves of this hit and immediately signs this man to a contract. Man, we're just like kids out here! The media will love us! The fan who tackled Seau was signed to a contract by the Detroit Lions after this incident. Here comes the tickle monster! "This isn't where I parked my car!" We're stuck. This Mighty Putty is too strong. "So this is the new Michael Vick Experience: Lockup Edition?" "Hey! light my fart light my fart"
Junior: We filled our bellies with goat meat. Junior: Once again, our bodies sluggish with goat meat. Matt Cassel: Okay, all right, okay, do you think there's any way we could save this one until after dinner. Mike Vrabel: And I was there, too. Matt Cassel: [shocked] Do you mean? You left home without your Depends Junior! Here they are!!! "I can't feel my legs...I CAN'T FEEL MY LEGS!" Aw man! You have wicked bad hemorrhoids! Like many sequels, "Deliverance 2: Gridiron Boogaloo" just doesn't live up to the original. Rich Eisen with the roll-up from behind...1...2...3!!! We have a new World's Champion!!! Dude....Seau hold still....I lost my watch. GOOD GOD, THAT'S LAWRENCE FRANK'S MUSIC!!!! Stoppp!! That tickles!!! That tickles!!! After being turned down by Brian Cox, the Patriots decide to hold in game tryouts for linebackers. Good ol' J.R. Jim Ross in the background: SMALL CRADLE! SMALL CRADLE! BY GAWD HE GOT IT! 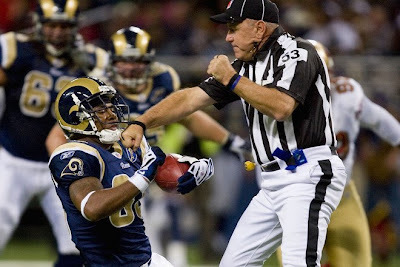 THE FAN JUST BEAT JUNIOR SEAU LIKE A GOVERNMENT MULE! BY GAWD! Vince Vaughn and Junior Seau star in the most talked about film in years...Dude...What Happened To My Career! The fan then proceeds to do just as Seau would have done after making a meaninless tackle and celebrates as if he made a game-ending sack. Fan: Oh man, Agent K, something's peekin!!! Seau: Do you see any needle marks? Are you happy now?